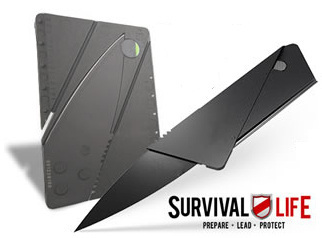 I'm really excited to be giving away 9700 FREE credit card knives as our way of introducing you to SurvivalLife. By far, this is the coolest little knife I've ever seen. So far we have already shipped more than 8683 of these knives in the last few days and we are QUICKLY running out, so grab yours now while supplies last. PLEASE NOTE: These blades are steel and they will set off any metal detectors. This product should not be taken onto airlines. The Credit Card Knife is notorious for being super sharp so please take care when handling this product. We will not be responsible for any injuries or damages. Built-In Safety Sheath - This prevents any accidents caused by an open blade in your pocket or pack, and even prevents the blade from becoming blunted during everyday carry.